Last week was the 100th anniversary of the Triangle Shirtwaist Factory fire, which took the lives of 146 workers, mostly immigrant women. Exit doors were locked, the single flimsy fire escape buckled and fell, and the trapped workers on the upper floors either burned to death or, in desperation, jumped to their death. 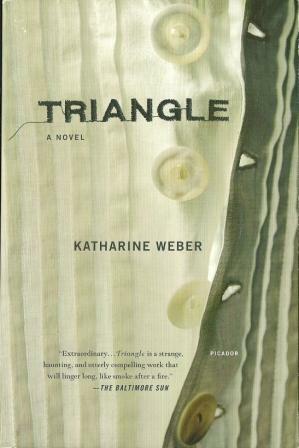 As I listened to multiple radio stories last week recognizing the anniversary, I remembered that I had an unread copy of Katharine Weber’s 2006 novel about the tragedy. This seemed like a very good time to finally pick it up and read it. The fire was getting hotter and it was everywhere, on the machines and the tables and all our work was burning up and the smoke was so thick and the smell was terrible, black from the oil and the burning goods and the smell was so strong, and everyone was coughing and gagging and choking, and there was also the very horrible smell of burning hair, and all those girls were pushing and pushing together, it was just so terrible I can’t really describe it, they were all pushing at once and the girls in the front maybe even got squeezed to death from the pushing but nobody could open the door. Fast forward to 2001, and Esther’s granddaughter, Rebecca, is getting hints from a feminist “herstorian” named Ruth Zion that Esther’s story is perhaps not as straightforward as it seems. Is there something she’s been hiding? Does Rebecca know her secret? Does she want to know? By setting the present-day story in 2001, Weber raises questions about the communal nature of great tragedies. For Esther, the Triangle fire was a personal disaster. She lost the two people closest to her that day. But it was also a moment of historical and political significance, so it was not her tragedy alone. Her grief and her nightmares become public, just as the pain of so many 9/11 survivors became public. In such a situation, privacy becomes almost impossible, and everything a survivor might share can be used to further someone else’s bigger agenda. Weber builds her story using newspaper articles, court and interview transcripts, and a standard narrative focusing on Rebecca and her long-time boyfriend George. All the different documents and articles have a wonderfully authentic flavor. I love that kind of thing in a book, and Weber creates and uses these “artifacts” well. Although the Triangle fire is probably the most interesting element of the book, Weber doesn’t focus exclusively on the fire. There are some lengthy descriptions of George’s musical compositions based on people’s DNA sequences, Sierpinski triangles, and other structures in nature. I found these bits pretty interesting, and sometimes kind of funny, but they were maybe a little overly long and felt like a distraction from the central story. More interesting was Rebecca’s work as a genetic counselor, which doesn’t get heaps of attention but proves to be extremely important plot-wise. As far as the central mystery regarding Esther goes, I figured out most of it from the very beginning. I thought the first chapter gave the game away. This did not, however, hinder my enjoyment of the book. Some of the clues seemed kind of ham-fistedly obvious, but the interesting thing is that Weber never quite divulges the truth. We’re given a final testimony at the end, but it’s in such a context that we can’t be sure whether it’s Esther’s version of events. Plus, there are also lots of implications related to what really happened that are merely alluded to. If there had been a tidy summing up, plus all the clues along the way, it would have been too much. But Weber provides all the information needed along the way and trusts her readers to get it. I liked the central characters in the book quite a lot. Rebecca and George have an unconventional relationship that most of their friends don’t even really understand, but I thought it was lovely, and it made sense for these two independent-minded people. The historian Ruth Zion is something of a caricature, which was perhaps unfortunate, but I must admit I got some laughs out of the Ruth-centric moments. And if I put myself in Rebecca and Esther’s shoes, I can see how this academic with an agenda would seem aggressive and intrusive and generally insensitive. Overall, a good read—not perfect, but clever and interesting enough to reward the attentive reader. I remember when this first came out and I thought it sounded good then and it still sounds good. It is good! I’m glad I finally got around to it. I had to have this when it came out in hardcover! Still unread, but maybe now is the moment for me to read it as well. I have read another of Weber’s books and liked it very much. Have you ever visited the building/museum? LOL. I know all about those must-have now books. Which of Weber’s other books did you read? I liked her writing, so I’d like to try something else. I haven’t visited the building, but I’m going to keep it in mind for a future NYC visit.